BATON ROUGE, La. — Alfred Shelmire has lived on the same street in the Brownsfield community of East Baton Rouge Parish for 23 years. Mrs. Shelmire says neighbors kept tabs on the renovations, often peeking in on the progress. The Shelmires opted for state-managed construction solution. They finalized their award amount on June 28. Installation of their new appliances, countertops, carpeting and more was completed by mid- July. Mr. Shelmire says there are still other homes on his street that need to be restored, and he’s glad to be one of the first to be served by Restore Louisiana. “We would like to first thank God for carrying us through this tough experience, Gov. John Bel Edwards, the Restore Louisiana Program and the construction companies who collaborated on this project to help flood victims get back in their homes,” says Shelmire. BATON ROUGE, La. (WAFB) — A Baton Rouge homeowner is one step closer to closure almost a year after the historic 2016 flood. 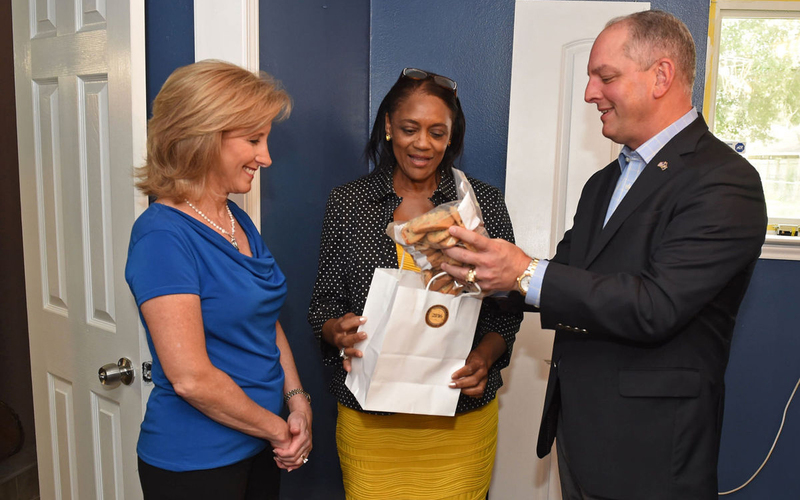 Lillie Gumm invited Governor John Bel Edwards and First Lady Donna Edwards to tour her Park Forest home Monday afternoon and see the progress made by the Restore Louisiana program, which she says is almost 90 percent complete. Gumm is one of the first people to sign up with the program and her home is the third one to be completed through the service. “I mean, just in about three weeks, my house has been completely turned around and the whole process took about three months from start to finish,” said Gumm. Gumm went with the state-managed option of the program, meaning just about everything from the walls to the counter tops and the cabinets were all done by state-hired contractors. She says it is the best decision she’s ever made. “They were so compassionate, it brought tears to my eyes because they were sensitive to what I had gone through,” said Gumm. As the anniversary of the historic flood approaches, the governor admits he is not satisfied with the speed of the effort, but wants critics to know they are working hard. “There’s a lot of things that we can do better. I can do a better job. People who work for me can do a better job and the federal bureaucracy can be re-examined and streamlined as well,” said Edwards. While Gumm is a success story, there are still many people out there who have not filled out the survey. It’s something Edwards and Gumm say needs to change now. “We’ve had about 37,000 people take surveys, but we know that there are thousands more who need to and that starts the process which will determine your eligibility,” said Edwards. Crews still have to complete a few more days worth of work before they are done, but Gumm says she’s 100 percent satisfied with what they have already finished. BATON ROUGE, La. — As a former state employee, retiree Don Lee has an insider’s perspective on government run programs. The Lees’ Baton Rouge home received 18 inches of water in the August 2016 flood. Once the water receded, Don and his wife, Marie, acted quickly to get their home habitable. Lee says he and his wife were fortunate to have friends, family and some contractors who helped with the work necessary to move back in. Lee learned about the Restore Louisiana Homeowner Assistance Program from TV and radio advertising. He and his wife chose reimbursement through the program because they had completed the bulk of their home repairs. BATON ROUGE, La. — Shardrica Augustus readily admits she gave her caseworker “hell” but couldn’t be any more pleased with the Restore Louisiana Homeowner Assistance Program. Augustus’ home in the Park Forest neighborhood of Baton Rouge had three feet of water in it during the August 2016 flood. She and two of her three children were out of the home until November when the Shelter at Home program made it habitable for their return. Her third child is a student at LSU. An employee of the Louisiana Department of Health, Augustus completed her homeowner survey in April and submitted her assistance application as part of Phase 3 in June. She received notice of her award in August, and her home restoration was completed in October. Augustus said her caseworker continually kept her informed throughout the process and offered encouragement when she became discouraged. Augustus said her neighbors were impressed by the construction crews’ diligence and attention to detail. BATON ROUGE, La. — The Ott family has owned land in the Denham Springs area for generations. The house Peggy Ott lives in was built in 1994 and had never flooded prior to August 2016. After a negative experience with a contractor Ott hired to help with repairs after the flood, she was excited to learn that the Restore Louisiana Homeowner Assistance Program offered a program-managed option to complete the construction process, “I thought that was a blessing right there,” said Ott. After receiving notice she qualified for the program, Ott said crews came out and took measurements, and estimated the work would take about two weeks. Construction began Oct. 13. “They’ve accomplished so much and I’m glad I chose the program contractor,” said Ott. GREENWELL SPRINGS, La. — The Meyer family built their home two years before it flooded in August 2016. Located in a Greenwell Springs neighborhood where flood insurance was not required, George and Helen had to rely on their own resources to rebuild. A family member who was also a retired contractor performed most of the repairs, but as often happens after a natural disaster to families without flood insurance, the Meyers’ were unable to stretch their FEMA funds far enough to finish the rebuild. Once he heard about the Restore Louisiana Homeowner Assistance Program, Meyer went to the program website and reviewed the guidelines. Confident they would qualify, Meyer completed his application and submitted documents online. Upon learning their application was moving forward, the Meyers chose the program-managed contractor option for remaining work in addition to the option to be reimbursed for work already completed. Once the Meyers received their award and signed their grant agreement, Restore Louisiana contractors spent four days on a variety of tasks in the house – finishing sheetrock, hanging door frames, installing baseboards, and painting. “I wasn’t sure what to expect, but the Restore Louisiana program has exceeded my expectations,” said Meyer. HAMMOND, La. — Mickie Huszar is thankful to be settling back into her home following extensive repairs on her flood-damaged house. Huszar’s home was inundated with water during the August 2016 flood. 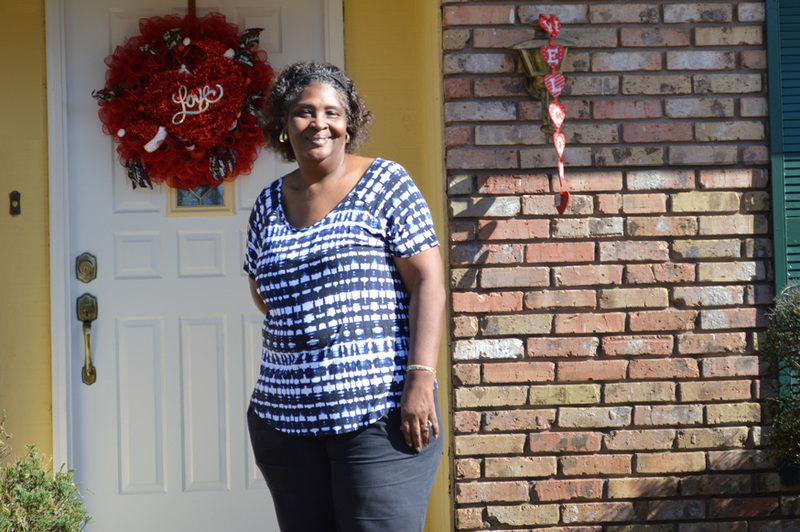 Like many, she turned to the Restore Louisiana Homeowner Assistance Program for help. 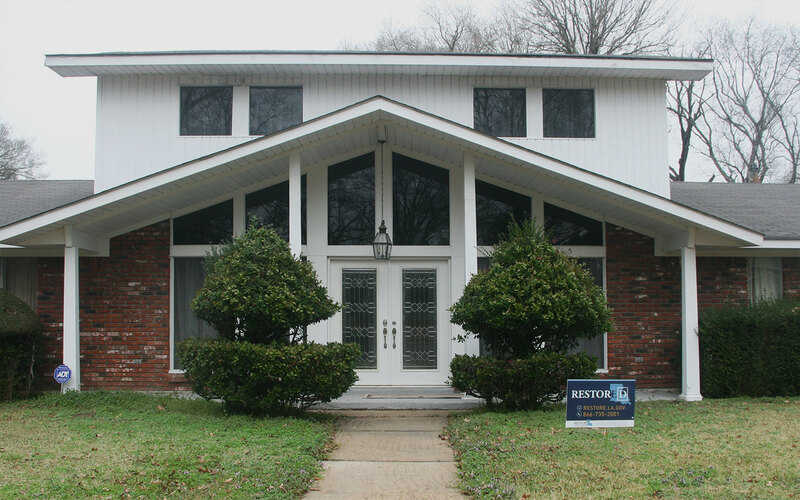 The restoration has been comprehensive – new drywall, cabinets, appliances, central heat and air. Huszar’s flood story is like that of many. During the middle of the night water entered her home. Before she could decide what steps to take, the trickle became a current and then a surge. “I’d never seen anything like it. Hope I never do again,” she said. After the final inspection of Huszar’s repair work, she will begin the task of moving back into her home. It is a move she looks forward to. BAKER, La. — Gary Cashe said he would literally have been up a creek had it not been for the team effort of the Restore Louisiana Homeowner Assistance Program and its many partners. Cashe’s home fell victim to the August 2016 floodwaters when water ruined everything from two feet down. Cashe said a big reason for the smooth flow of the process is that he was fortunate to have all his paperwork in order. “We had everything documented,” he added. Cashe said he’s now in what amounts to a new home – new drywall, cabinets, wiring, flooring, appliances, and central heat and air. “We certainly appreciate the support and help we received from Restore Louisiana,” he said. BATON ROUGE, La. — When Emma Johnson returned to her home immediately after the 2016 flood, she was dismayed to find 4 feet of water. “We didn’t know what to think,” she said. 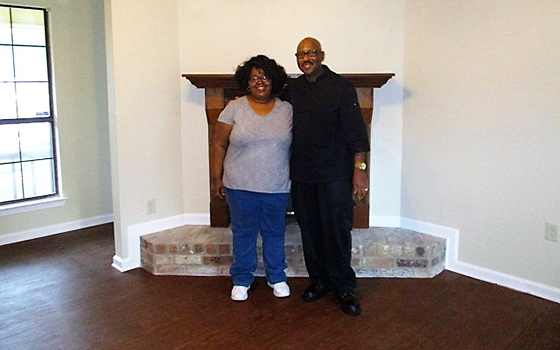 Today, she is happy to be in her repaired home thanks to the Restore Louisiana Homeowner Assistance Program. “They did a real good job,” she said, praising the contractor and workers who completed the work. A friend told Johnson about the Restore Louisiana Program and she completed her survey over the phone. She is appreciative of the caseworker who helped her. “She was very nice and walked me through the process,” says Johnson. Johnson chose to use the program-managed construction option because she had confidence the work would be completed in a reasonable timeframe. “I knew they were professionals,” she said. The work done on Johnson’s home included replacing the pantry, several doors and floor moldings throughout, as well as painting much of the home’s interior. 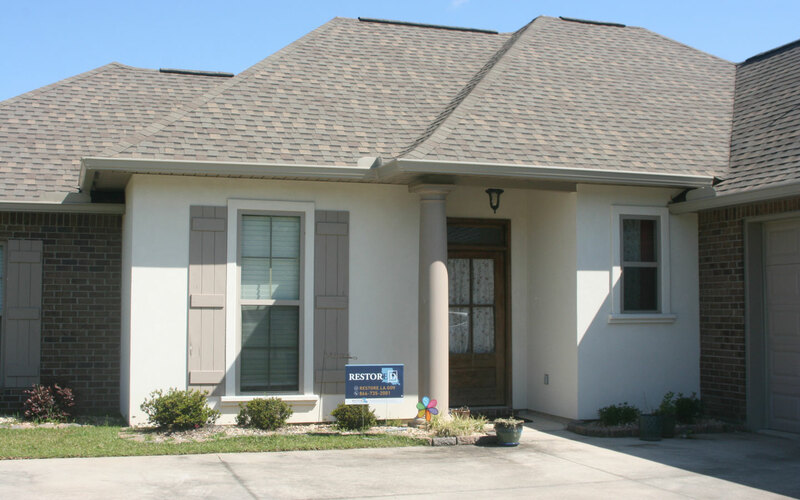 On the outside of the home, Restore Louisiana replaced insulation around the hot water tank and provided a complete exterior wash.
BATON ROUGE, La. — Viola Wilson is truly celebrating the fact that her home has been rebuilt by the Restore Louisiana Homeowner Assistance Program. 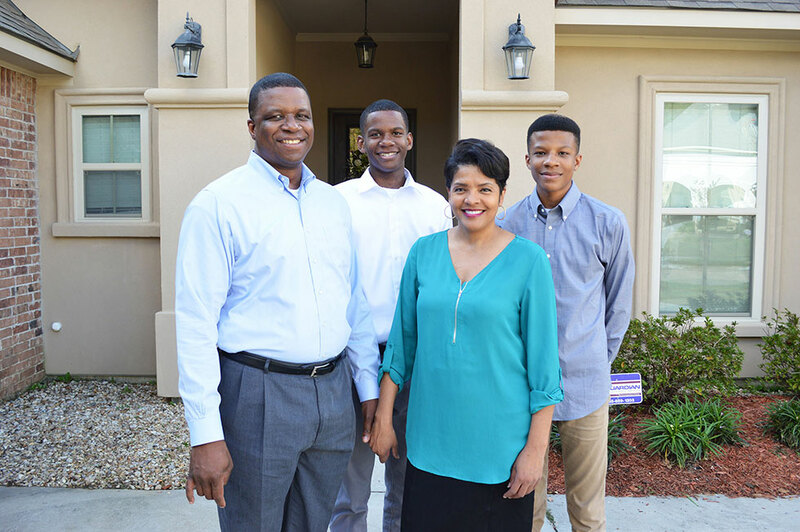 While the work was extensive – new carpet and flooring, kitchen and bathroom cabinets, and doors – Wilson says the Restore Louisiana contractor made everything easy for her. “They always let me know when they were coming and when they weren’t. They worked every day but Sunday, and got everything done quickly,” said Wilson. Prior to her participation in the Restore Louisiana Program, Wilson hired contractors to begin work on her home, but she experienced frustration in dealing with them. Wilson’s daughter found out about the Restore Louisiana Program on Facebook and helped her mother complete the application process. Wilson chose the program-managed construction option and was happy not to have to worry about managing the construction process. BATON ROUGE, La. — Mary Earthly was at home preparing for her mother’s funeral when the floodwaters headed towards her house in August 2016. With her home full of family and friends, it took three trips in an inflatable swimming pool to get everyone to safety. Children were evacuated first, and 63-year-old Earthly was one of the last ones to leave the property. Today, she is grateful to Restore Louisiana for helping her get back into her home. Earthly remembers that as the water kept rising, she and her family had to leave quickly. She returned to her home a week later to find that she had lost everything, and the home was completely unlivable due to water damage and mold. The walls were taken down to the studs to begin the process of restoring the structure. After using FEMA funds to do some of the construction work, Earthly heard about the Restore Louisiana Homeowner Assistance Program on her local television news. “When I found out about it, I called instantly, and I’m so glad I did,” she said. Restore Louisiana finished interior work on the walls, floors, cabinetry, and doors as well as the necessary electrical work. In addition, Restore cleaned and painted the exterior of the house. Earthly was thrilled to get back into her home two and a half weeks after the start of the work. Earthly’s advice to homeowners who are still dealing with flood damage? “If you want to get back into your house, you should contact Restore!” She says she was patient with the program, and her patience definitely paid off. TICKFAW, La. — “I’m able to live in my home again, and that’s everything,” says Leon Dauterive, who suffered extensive damage to his house in a 2016 flood. Restore Louisiana helped Dauterive get back into his home by completing repairs including replacing doors, flooring and appliances, as well as some interior and exterior painting. 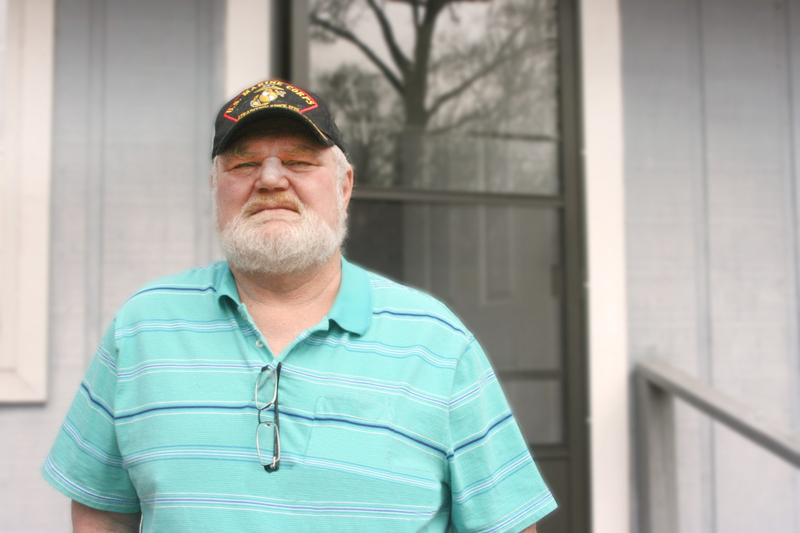 Dauterive completed some work using funds received from FEMA, but after those funds had been exhausted, repairs were still needed for him to get back into his home. He learned about the Restore Louisiana Homeowner Assistance Program on the news and went to the Housing Assistance Center in Hammond, where he completed an application and was assigned a case manager. “She was a very pleasant lady and always very responsive, returning my calls quickly and keeping me updated on my status,” he said. 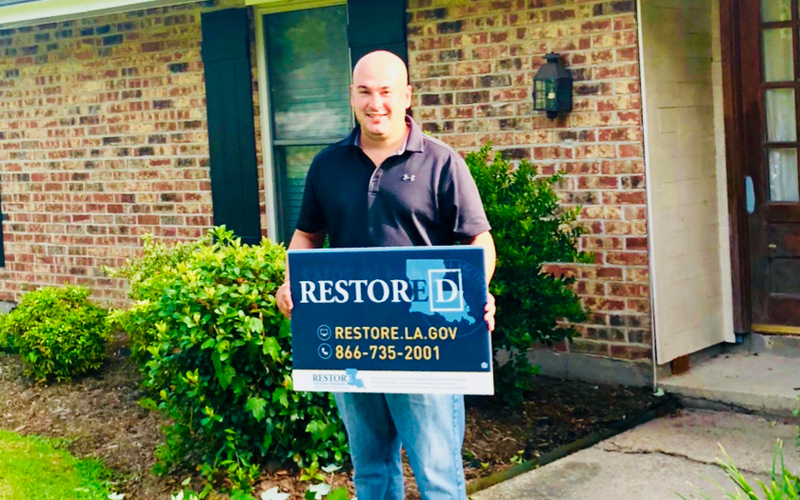 Dauterive was so pleased with his experience with Restore Louisiana that he told neighbors about it and encouraged them to pursue their options through the program. “You are hurting yourself if you don’t contact Restore and see what they can do for you,” he says. “They definitely do care about getting people back into their homes,” he said. MONROE, La. 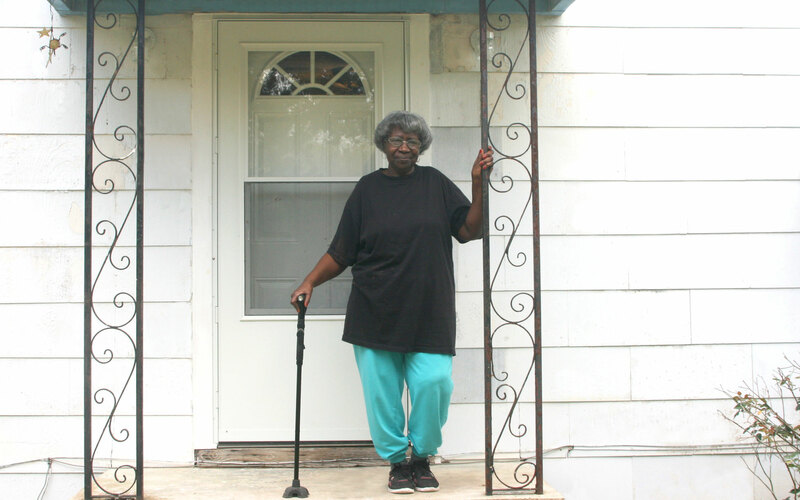 — Bessie Bolden lived in her home for more than 35 years and never experienced flooding – that is, until March 2016. Thankfully, first responders helped her get to her daughter’s house on higher ground, but when the family returned a few days later, her home was completely unlivable. They began work on repairs and Bolden moved back in about a year after the flood, but the home was far from complete. 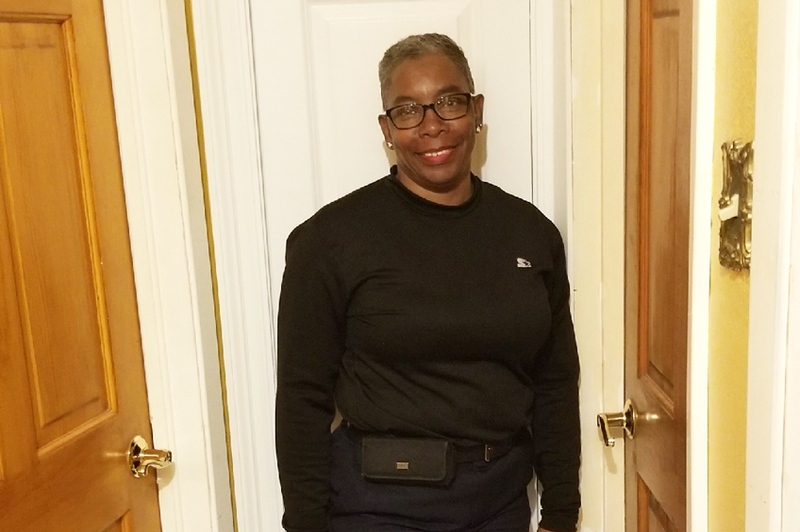 When Bolden’s daughter, Barbara, heard about Restore Louisiana, she completed a survey for her mother on the Program’s website and began working with the case management team as soon as Bolden’s application was made available. Restore Louisiana contractors have now completed repairs to Bolden’s home, including the interior walls and doors, and completely redid one of her bathrooms. Barbara is now reaching out to other family and friends who were affected by the devastating floods of 2016 to tell them about the Restore Louisiana program. BATON ROUGE, La. (WBRZ) — A woman affected by the August 2016 flood is thankful for a construction crew and the help of Restore Louisiana. The crew showed up to her flood-damaged property with an excavator Monday morning to tear down the dilapidated house. 2 On Your Side has been following Floy Cook’s story since last June when she said she only had one option, which was Restore Louisiana. The roller coaster she’s been for the last year and a half is almost over and she’s one step closer to going home. As Cook watches the destruction, she thinks back on a happier time in her neighborhood. “It was one of the first houses built out here,” she said. 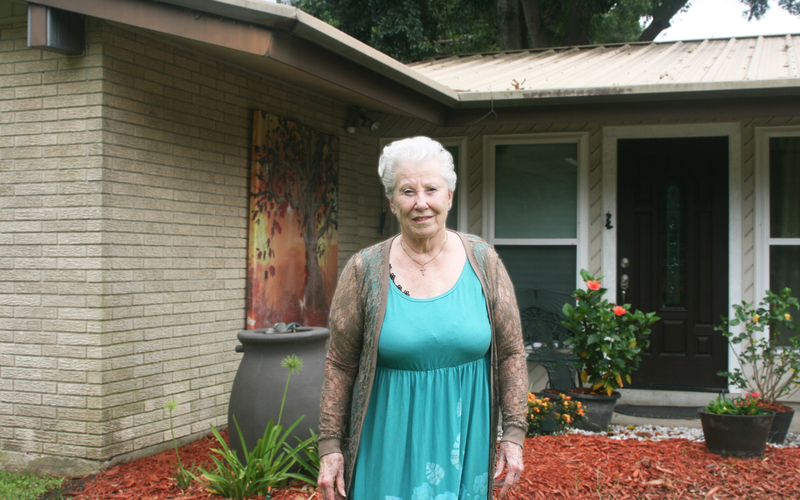 She’s lived in her Baton Rouge neighborhood for nearly 50 years. When the flood hit, it destroyed the property she’d raised her family in. Monday, she said the wait has all been worth it. Her flood-damaged house is one of 70 that are being torn down and reconstructed through the Restore Louisiana Program. The damaged structure was torn down and the land will be cleared to make way for a new foundation and house. 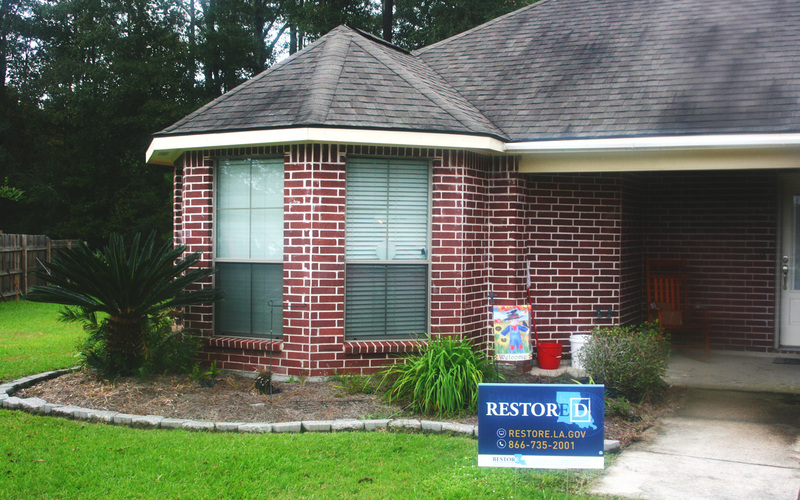 Restore Louisiana reconstructs homes when the cost of repair is 80 percent or more of the house value pre-storm. “Once we get to 80 percent, it becomes way more economical to just start over,” said Director of the Office of Community Development Pat Forbes. Once it’s complete, Cook’s new 1074 square foot house will have three bedrooms and two bathrooms with energy efficient heating and air conditioning. 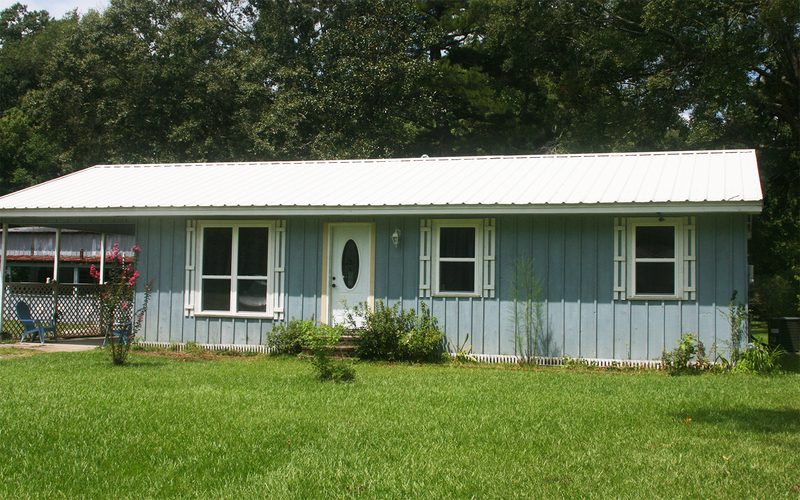 Restore Louisiana developed a standard price per square foot of $78 for home reconstruction. Cook’s home will be in the $75-80,000 range. Restore Louisiana says getting to the reconstruction process was not easy. 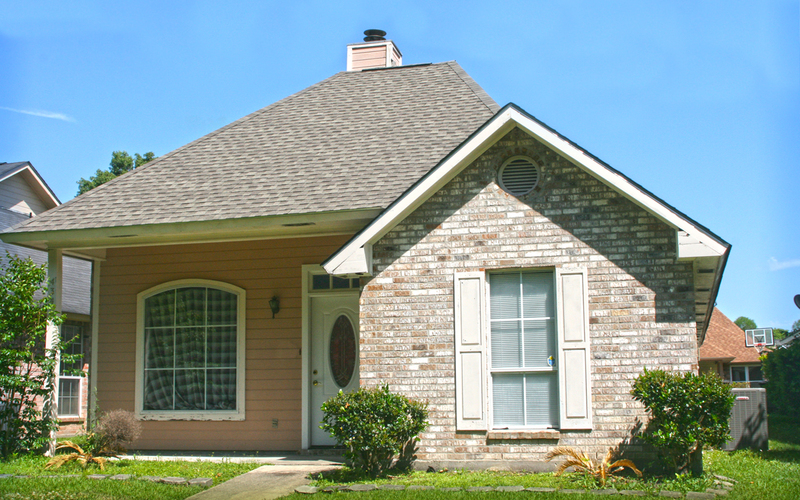 Market conditions were analyzed to develop a price that’s fair to homeowners and meets federal standards. Restore says it will likely have more reconstruction projects as it continues the process. Restore says it has money for all 27,000 applicants and the whole point of the program is to get people back in their homes and help neighborhoods bounce back. Building a house from scratch is a big process. Between repairs, reimbursements and reconstruction through the Restore program, reconstruction is the most complicated. While Restore says it’s moving along, it knows it isn’t moving fast enough. It’s why Cook is so thankful her day has finally arrived. “I don’t know what I’d done without them,” she said. Restore Louisiana says it will take about six months to complete each reconstructed home. The program has five primary contractors that have hundreds of contractors working for them state-wide. BAKER, La. — Barbara Pierce says Restore Louisiana not only restored her house – it restored her sense of peace and enabled her to feel truly at home again after more than a year of being out of her home after the August 2016 flood. Because the house was not in a designated flood zone, Pierce never expected it to flood, but as the waters continued to rise, she realized that this flood was unlike anything she’d seen before. Pierce was brought to safety by a neighbor’s son and lived with her daughter for the next few months. The Federal Emergency Management Agency (FEMA) provided funding that allowed Pierce to do some basic work, but when she moved back in, she was still without windows, doors or cabinets. She couldn’t afford to do any additional work on her own. Pierce heard about Restore Louisiana from a friend and went to the website to begin the process. She was soon speaking with a case manager from Restore Louisiana who helped her complete the application. When the contractors began working on her home, Pierce was thrilled with the quality of the work and the options they gave her in choosing her materials. Pierce says that the workers were courteous and the process went smoothly. Restore Louisiana completely refurbished two bathrooms and installed new floors, doors, windows and closets. Pierce is especially pleased with her new kitchen, which the program equipped with a new stove, refrigerator and dishwasher. LAFAYETTE, La. — After living in a camper on their property for more than a year following the August 2016 flood, Beau Phares and his family are excited to be back in their home now that Restore Louisiana has helped them complete repairs. As the floodwaters rose in the Lafayette area, Phares was able to move his wife and three young daughters to a neighbor’s house on higher ground. He stayed behind to salvage the few personal items he could. After the flood, Phares used FEMA funds to complete some repairs, but those funds did not cover all the costs of repair – not to mention what he had spent out of his own pocket. Phares heard about the Restore Louisiana Homeowner Assistance Program through family and friends, and he began speaking with case managers in Lafayette who guided him through the process. “They did a great job. When I had questions, they answered them. I can’t imagine how many people were calling them on a daily basis, but they were always patient and helpful and took time with me,” he said. Phares was eligible to receive both reimbursement for the work already completed and funds to complete the remaining repairs. He chose Solution 2, allowing him to manage the construction himself. BAKER, La. — Joann Gosa, who teaches at a preschool in Baker, was at work on August 12, 2016, when she received a call that her neighborhood was flooding. She hurried home to find water rising outside her home and quickly saved a few personal items before the water began flowing into her house. When she returned a few days later, she was shocked to see her home in such a state of disrepair. She lived with her daughter over the next few months as she began the repair process. 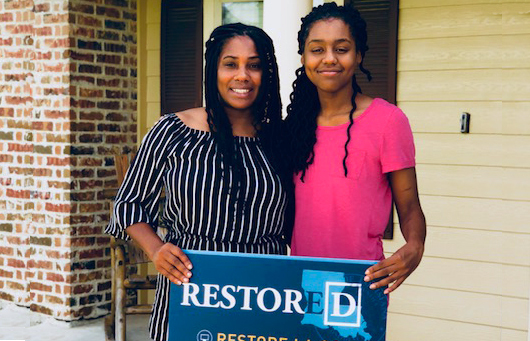 When one of the parents at Gosa’s school told her about Restore Louisiana and encouraged her to apply, she went home that very night and completed the survey. Because she was already working with a contractor she trusted, Gosa chose Solution 2, which is the homeowner-managed construction option. She was pleased with her Restore Louisiana case manager, who told her exactly how things were going to proceed. Restore Louisiana reimbursed Gosa for the extensive repairs already completed, including walls, kitchen cabinets, bathroom vanities, baseboards and floors, and assisted her with a few remaining repairs. Gosa is now relieved and happy to be back in her finished home. Gosa has told several friends about the program and encouraged them to contact Restore. BATON ROUGE, LA — As the rain kept falling and waters rose on Saturday, August 13, 2016, Troy Carter hoped his home would be spared. He and his wife had taken in their son, daughter-in-law and grandson because their home had already flooded. Before much longer, a team of firefighters came through the neighborhood encouraging families to evacuate. The water was already too high for them to drive to a safer location, so they walked a mile and a half to the front of their neighborhood where they were picked up by rescue workers. The Carters were able to get to Troy’s mother’s home, but they soon needed to evacuate from that location as well. Together, the four generations finally settled at a friend’s house for a few days until they could rent a hotel room. When the family was finally able to get back home, Carter was devastated to see the toll the flood had taken on his home. Carter began repairing his home but says it was barely in livable condition. When he heard about Restore Louisiana on the news, he immediately went online to fill out the survey and was soon contacted to complete his formal application. Carter chose Solution 1, in which a program contractor completed remaining repairs. Restore contractors provided Carter and his family with new appliances, a kitchen sink, bathroom vanities, countertops, baseboards and doors. They also installed a new air conditioning unit. Carter and his wife lived in the home during the four or five days it took the crews to complete the work, and he says the process went smoothly. Carter now encourages others who were affected by the 2016 floods to contact Restore Louisiana. MAURICE, LA — As the rain and flood waters of August 2016 bore down on the state of Louisiana, Paul Bourque was in Texas for work, unable to return home for more than a week due to closed roads and remaining floodwaters. Thankfully, Paul’s wife and children back home were able to be rescued and taken to safety by Red Cross, but when the family finally reunited and returned home, they realized their mobile home was barely livable. Paul and his family soon moved into a camper and began salvaging the remains of their home. Using funds received from FEMA, they were able to make very basic repairs and move back into the unit, but Paul says they did not have enough money to fix the walls, add necessary insulation, or replace the damaged air-conditioning system ducts. 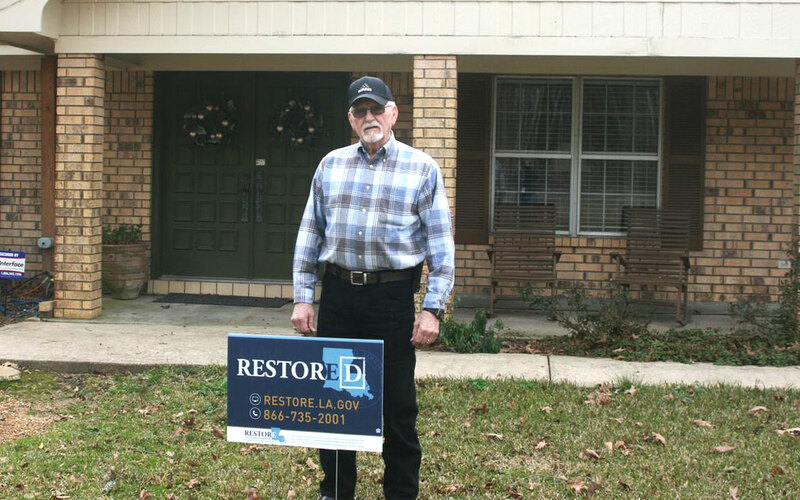 When Paul saw a sign for Restore Louisiana, he immediately called and completed the initial survey. Paul later visited the Lafayette Housing Assistance Center to complete his application. 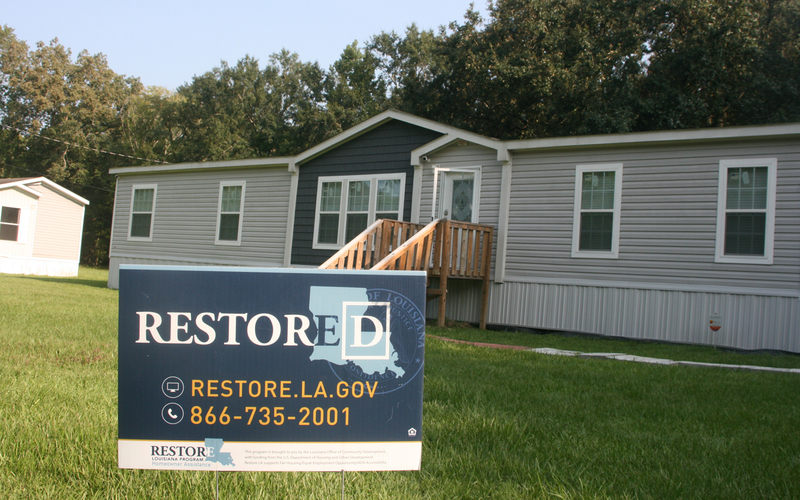 When he contacted Restore Louisiana, Paul says he was simply hoping to receive enough funds to make his damaged mobile home functional again. However, Restore Louisiana’s policy is to replace, not repair, damaged mobile homes to best serve the long-term housing needs of mobile home owners and their families, and to protect them from future environmental health hazards. Paul said he was thrilled to hear this news because it meant that his family could purchase a brand-new home. After bouncing between a camper and a damaged mobile home for over a year after the flood, Paul and his family are grateful to have a safe, comfortable home again. From his initial contact with Restore Louisiana to his move-in day, the process took about six months. DENHAM SPRINGS, LA — Deborah Allen, like many other Louisiana homeowners, watched in disbelief as the floodwaters continued to rise into her elevated mobile home in August of 2016. Because the road into Deborah’s mobile home community was impassable for eight days, she and her son took shelter at a neighbor’s house until they were able to leave. They later moved into a friend’s home, where they stayed for several months until FEMA provided temporary housing. When she heard about Restore Louisiana on television, she called the phone number immediately to see if she qualified for any assistance through the program. Although she was receiving temporary housing assistance from FEMA, she was still in need of a long-term housing solution as the floors, electrical outlets and walls of her mobile home were completely ruined. 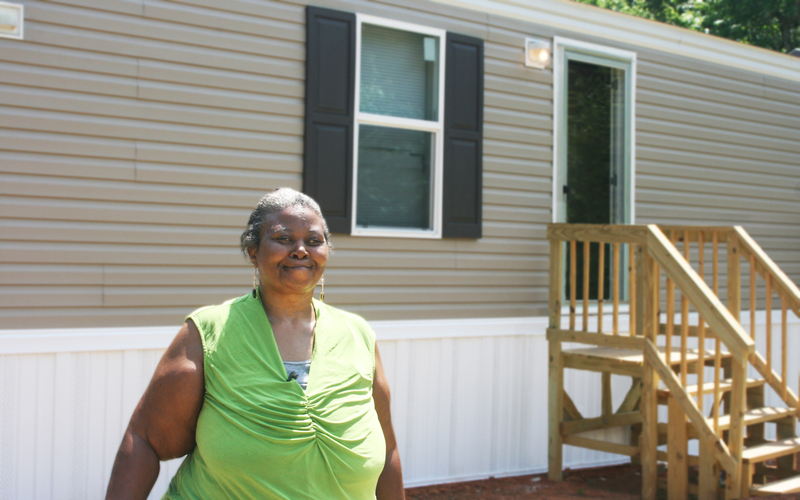 Deborah was thrilled to find that Restore provided funds for replacement, rather than repair of mobile homes. It took several months for Deborah to complete the Restore Louisiana application process, but she did not get discouraged. After she received her grant award, she soon found a new single-wide mobile home that had all the features she wanted. TICKFAW, LA – Natasha Selders thought she had avoided flood damage to her home on Friday, Aug. 12, 2016, but she awoke Saturday to find that the floodwaters hadn’t gone down and were instead rising into her home. Natasha contacted her brother to help move her and her three children to safety, and they stayed with her brother in Hammond for a week until they could get back home to evaluate the damage. “The smell was bad, but we moved in and made the best of it,” Natasha said. Natasha attempted to make repairs to her mobile home, but she says that she could not restore it to a suitable living environment for her family. 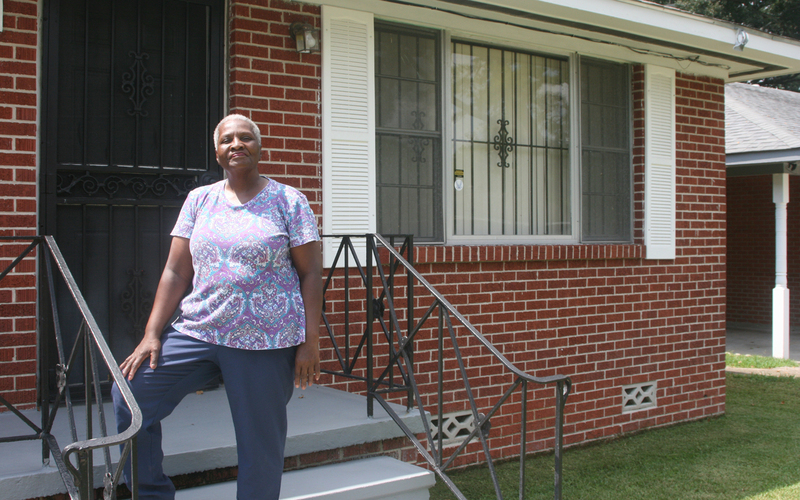 Over the next few months, Natasha received emails and phone calls from Restore Louisiana inviting her to complete the homeowner survey, but she ignored them. “I thought they wouldn’t help me or there would be too many strings attached, but finally I decided to give it a shot,” she said. Natasha completed the survey online, and within two weeks, a program representative came to her house to conduct the environmental review. She was assigned a case manager who helped her fill out the formal application and guided her through the process. At times, Natasha admits that she became frustrated with the amount of documentation needed and thought about not completing the application process. But her case manager contacted her often and encouraged her to continue. “She called me and told me I was almost there, so I listened to her and sent her what she asked for,” Natasha said. Natasha was ultimately able to buy a new three-bedroom, two-bathroom mobile home with the funding she received from Restore Louisiana. She encourages people still recovering from the 2016 floods to contact Restore. GREENSBURG, LA – Brenda Self says the Restore Louisiana Homeowner Assistance Program was the miracle she so desperately needed after the August 2016 flood left her mobile home damaged beyond repair. Brenda initially saw information for Restore Louisiana on television, filled out the initial survey online, and was later invited to complete the application. She visited the Housing Assistance Center in Hammond for assistance with her application. After a damage assessment and completed application, Brenda was thrilled to hear that she would receive funds for a brand-new mobile home. This was welcome news, as she had been displaced after having to evacuate on foot during the flood and temporarily live with a friend until she had a more permanent living situation. Restore Louisiana’s policy is to replace, not repair, mobile home units to avoid potential health and environmental hazards associated with rehabilitating flood-damaged mobile homes. Brenda is now back home on her property with a brand-new, three-bedroom and two-bathroom mobile home unit, and she encourages all who were affected by the flood to call or go online to see if the program can help them too. For more information about the program’s manufactured home policy, please click here. DENHAM SPRINGS, LA – After being ordered to evacuate his mobile home by state police during the August 2016 floods, John Johnson is grateful to return to a safe, new mobile home purchased with his Restore Louisiana grant funds. As the floodwaters continued to rise and proved to be extremely hazardous, John and his wife were taken by boat to higher ground, and eventually took shelter at a friend’s home. After a week, they returned to find their mobile home destroyed by the floodwaters. John saw information about Restore Louisiana on television and called to complete the homeowner survey. Shortly after, an inspector came out to assess his damaged home. “He was very helpful. I enjoyed working with him,” says Johnson. John visited the Baton Rouge Housing Assistance Center to complete the formal application. Fortunately, all of his important documents remained dry, and he was able to provide the documentation needed to his case manager. John encourages all flood-affected homeowners to complete the Restore Louisiana survey and begin the process of requesting assistance. If you were affected by the March or August flooding of 2016, click here to get started on your Restore Louisiana homeowner survey. DENHAM SPRINGS, LA – Grace Annette Johnson says the August 2016 flood was like a bad dream. As she and her husband watched the floodwaters creep up their drive way and then recede as the day went on, they thought their home would ultimately be spared, but when they woke up on Saturday, August 13, 2016, they looked out the window to see what appeared to be a tidal wave heading toward their home. The water submerged both of their vehicles and began pouring into their home. Grace Annette and her husband quickly evacuated, wading through shoulder-deep water to reach a rescue boat that brought them to higher ground. “We left with the clothes on our backs, and our two dogs, and that was it,” Grace Annette said. After two days, she and her husband returned to find major damage to their home. They began the painstaking process of repairs by tearing out sheetrock and flooring. Although the Johnsons lived in the house throughout the repair process, it was far from comfortable and certainly did not feel like home. “We slept on an air mattress and ate out of an ice chest,” Grace Annette said. Because the Johnsons did not have flood insurance, they used their retirement savings to make repairs to their home. When Grace Annette saw commercials for Restore Louisiana on television, her husband encouraged her to call and ask if assistance might be available for them. She called and completed the survey over the phone. Grace Annette said she was thrilled to get a call that they had been approved for a grant award. “When she told us what we were getting, I almost passed out! It really is a blessing,” she said. Now Grace tells her friends and neighbors about Restore Louisiana and encourages everyone who has not already completed the initial survey to do so. ZACHARY, LA – After being urged by her daughter to evacuate, Sharon Rushing packed a few personal items and waded through flood waters, with her dogs in tow, to her daughter’s second-floor apartment across the street. Once the flood waters receded, Sharon found that her mobile home was damaged beyond repair. Although she was able to salvage a few pictures and other belongings that were above the water line, she ultimately had no choice but to demolish the structure. “It was traumatic; I had raised my children there, but it had to go,” Sharon said. Sharon’s daughter told her about Restore Louisiana, and Sharon quickly went online to complete the initial homeowner survey. 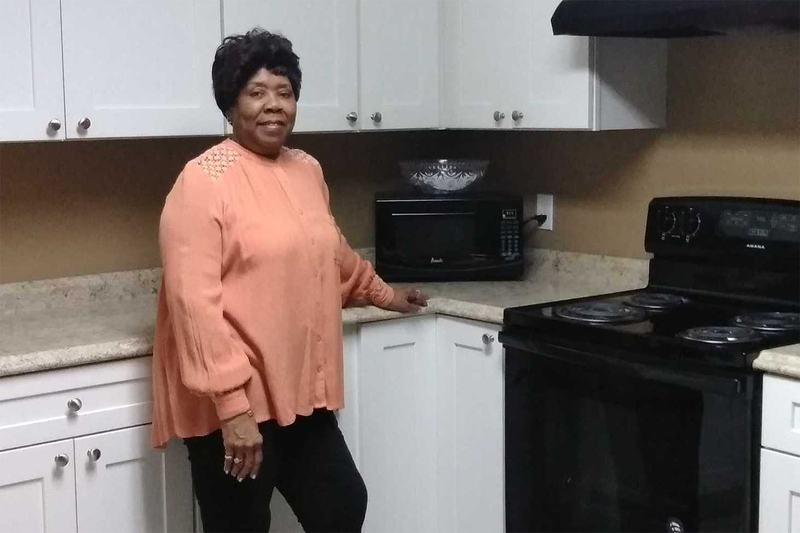 Sharon was thrilled to receive a grant from Restore Louisiana and chose a replacement mobile home she could personalize to make it truly feel like her own. Sharon acknowledges that recovering from a disaster is a difficult process, but she is grateful to be settling into her brand-new home and finally feel like things are returning to normal. She says her neighborhood is returning to normal as well. BATON ROUGE, LA – Marie Adams and her daughter went to sleep with plans to stay in their home and wait out the August 2016 flood, but they woke up to find that the floodwaters had entered their home overnight. Rescue workers brought Marie and her daughter to a shelter where they stayed for a few days until they were able to return home and observe the damage the floods had caused. While Marie was in the process of making repairs, she heard about the Restore Louisiana program and visited the Baton Rouge Housing Assistance Center to complete her initial homeowner survey. Through Restore Louisiana, Marie was reimbursed for the work she had already completed and opted to have a program contractor finish her remaining repairs. Marie was relieved and thankful when the repairs to her home were finished and she could return to her house. At 84 years old, she said that the best part of having a stable, long-term housing solution is knowing that she will not have to be dependent on her children. “Nothing says peace like walking back into your own home,” Marie said. BATON ROUGE, LA – Edna Wray and her son frantically packed their bags and left their home during the August 2016 floods, unsure when they would be able to return. Today, she is elated to be back in her home, thanks to assistance from Restore Louisiana. After the floodwaters receded, Edna returned home to find her home nearly destroyed. Her family and friends helped her complete imperative repairs to get her home back into a livable condition, but she still had a long way to go. Edna heard about the Restore Louisiana program on the news but did not think she would qualify for assistance. Her daughter contacted the program on her behalf and encouraged her mother to complete an initial homeowner survey. Wray says she didn’t understand a lot about the program process at first, but her case manager worked with her to gather all necessary documentation and assist her throughout the process. 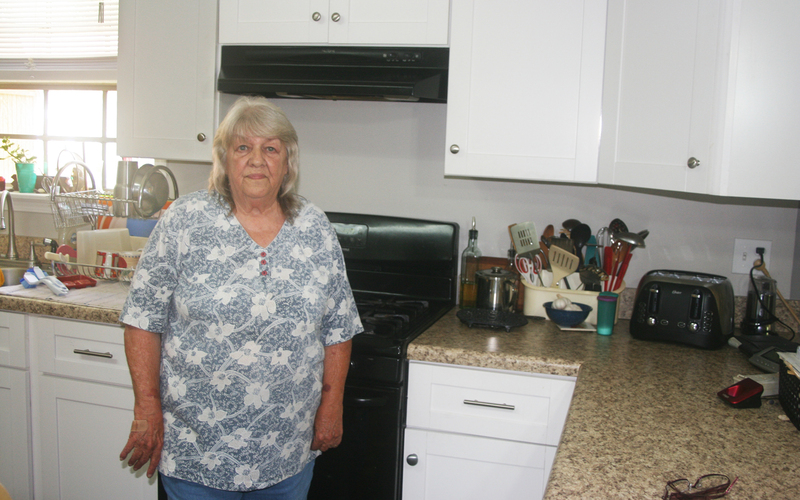 Edna chose Solution 1 and used program contractors to finish the repairs to her home. She said the contractors were diligent, professional and prompt in completing her remaining repairs. BATON ROUGE, LA – Robertine Collier and her three children are back in a safe, fully repaired home after experiencing extensive damage from the August 2016 flood. “I’m grateful for Restore being there and for helping my family through the flood recovery process,” said Robertine. As the floodwaters rose into their home, she and her family fled to safety, and even when they returned the next day, floodwaters were still chest-high. Although she was able to retrieve a few pieces of clothing, the family had to stay elsewhere until the water receded. Once she could get back inside the house, Robertine’s co-workers helped her remove carpet and begin the process of repairing the home. During her recovery process, she saw an advertisement for the Restore Louisiana program and went online to complete a survey. She was pleased to find that the process was simple and easy to follow. She followed up often and worked with her case manager who was able to answer any questions she had throughout the application process. Robertine chose the program’s Solution 1 option, allowing the program’s contractors to complete her repairs. She was pleased with the contractors’ professionalism and timeliness. BATON ROUGE, LA – Mrs. Bowlin evacuated to New Orleans as the floodwaters rose into her home in August of 2016. She returned to Baton Rouge as quickly as possible to meet her husband, who remained behind to salvage what he could. The couple stayed with Bowlin’s sister until the water receded and they could return to their neighborhood. When Bowlin returned home and saw the damage left behind by the flood, she felt overwhelmed and unsure of how to begin the journey to recovery. But, like so many who were affected by the floods, she and her husband jumped right in and began cleaning out their house with the help of family and friends. They lived in a trailer in their back yard over the next several months as they completed repairs. During the repair process, Bowlin learned about Restore Louisiana and completed the initial survey over the phone. Program representatives then contacted her and invited her to complete her program application. Program inspectors came to her home to see the work that had been done. They took pictures and measurements, and in a few weeks Bowlin received a call confirming that she would be reimbursed for the work she had already done. She opted for the program’s contractors to complete her remaining repairs. “The money really helped out, because recovering from the flood was so overwhelming,” she said. Mrs. Bowlin is relieved to be back in the house she’s called home for 14 years and advises others who are going through the Restore Louisiana application process to stick with it. “It’s worth it. Restore Louisiana did a fabulous job and I’m so thankful for them,” she said. LAFAYETTE, LA – Leslie Viltz had moved into a new home just prior to the August 2016 floods. “We had saved for years to build the house and to see it filled with water was devastating,” Leslie said. She and her family are thrilled to be back in their house, thanks to assistance from Restore Louisiana. Leslie, her husband and their five children were at home during the flood as they watched floodwaters rise dangerously high. After deciding it was unsafe to stay, Leslie’s husband alerted rescue workers on their street, and the family evacuated by boat. “It was heart breaking. All of our money had gone into building the house, and now everything was in ruins,” Leslie said. Leslie and her husband began to clean and gut their house. They received some relief through FEMA, but still had many repairs remaining to completely restore their home. Leslie saw information about Restore Louisiana on a billboard and went online to learn more about the program. She read stories of homeowners who had already received assistance through Restore Louisiana, which motivated her to apply. She quickly completed a program survey. “I found it to be straightforward. I knew it was a process, and I was okay with that. I was just grateful that help was coming,” said Leslie. Leslie continued working with her case manager to complete her program application and chose to have Restore contractors complete her home under Solution 1. “The workers were courteous and very detailed. They cleaned up after themselves, which I appreciated,” said Leslie. “It felt great. I can’t put it into words, but it was the best feeling. 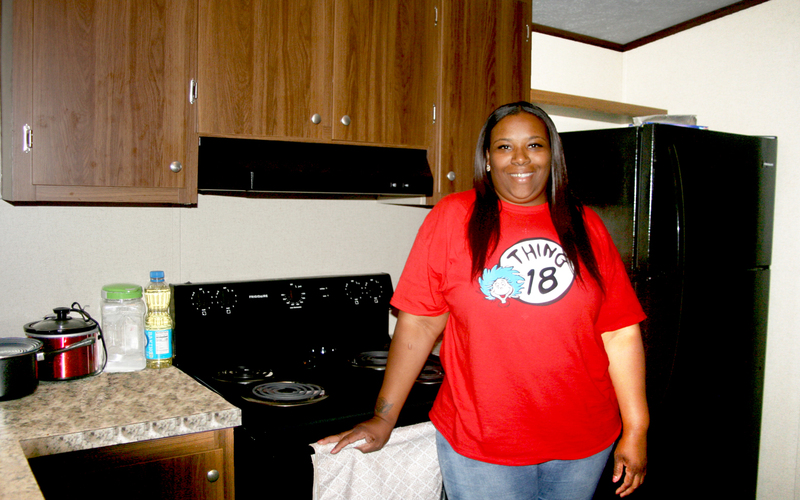 Truly a blessing!” Leslie said upon being able to move back into a safe, fully restored home. 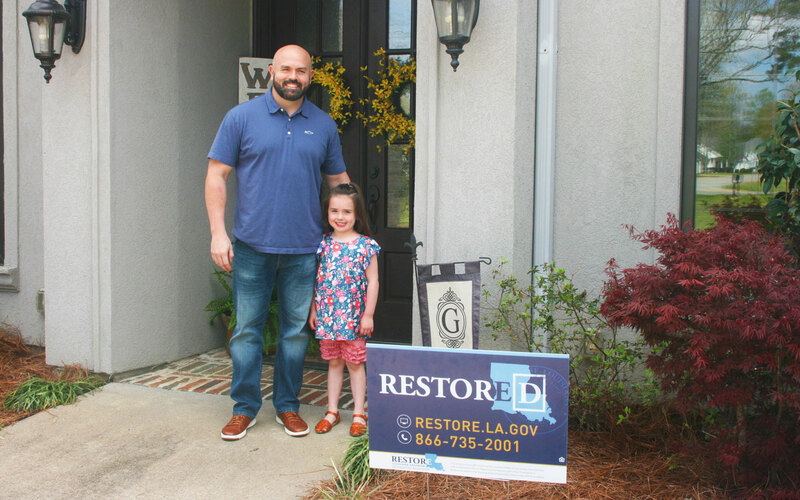 LAFAYETTE, LA – After receiving assistance from Restore Louisiana, John Rebstock and his family are back in their fully-restored home that was damaged by the August 2016 flood. “I’m just so grateful this was available,” he said. John was home with his wife and children as floodwaters rose dangerously high, so they decided to pack what they could and leave for safety. John returned home as early as possible the next day to assess the damage. Although the water had receded, he saw that he would have to replace all of his flooring and much of his sheetrock. John’s family lived with relatives for the next few months, but he moved back into their damaged home and worked daily to complete repairs. 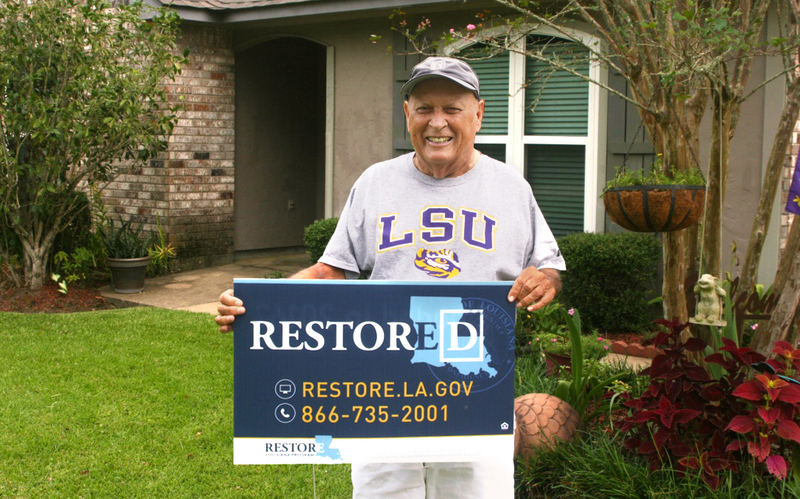 During his repair process, John heard about Restore Louisiana. He immediately went online to complete a program survey. He was able to complete most of his application online and worked with his case manager to submit his supporting documentation. John was eligible for reimbursement funds for the repairs he had already completed, as well as additional funding for remaining repairs, which he opted to let the program’s contractors complete. John was thrilled when his wife and children were able to move back into the home, and their lives could get back to normal. “Be patient. It’s not going to happen immediately. There were a lot of people that flooded and need to be helped,” said John to homeowners still completing the Restore application process. “I’m very happy, and I’m just grateful for the program, period,” he said. BATON ROUGE, LA – Dorothy Iron was at home in August 2016 as she watched floodwaters rise and seep into her house. At the last minute, she evacuated with the help of a neighbor. Dorothy stayed with her daughter until the floodwaters receded, and once she was able to return, she found her home in an unlivable condition. She remained with her daughter for several months after the floods, going back daily to salvage what she could. Dorothy hired a contractor and enlisted the help of family members to begin the repair process. During this time, she learned about the Restore Louisiana program and visited her local library to fill out the initial survey on a computer. Shortly afterward, her case manager contacted her to walk her through the application process. Dorothy worked with her case manager during every step of her application process and was eventually awarded grant funds to reimburse her for the repairs she had completed to her home. Additionally, she chose the Solution 1 program option, allowing the program’s contractors to complete the remaining construction to her home. “They did a lot of things I needed done, and they did a good job,” she said. EUNICE, LA – After the August 2016 floods, Janice Moon was left with the burden of not only repairing her flood-damaged mobile home, but also with repairing the home of her elderly mother who lived next door. Today, she is relieved that she and her mother are back in safe homes, thanks to Restore Louisiana. After watching the floodwaters rise dangerously high, Janice called the fire department who rescued her and her mother in a boat. They stayed in a motel for several days until Janice could safely return and assess the damage. When Janice returned home, she discovered that both her mother’s home and her mobile home were unlivable. Over the next few months, Janice worked to repair her mother’s home first. Janice was determined to get her mother back into her house where she would be in a familiar environment, as she suffers from dementia. This repair process left Janice frustrated and exhausted. The announcement of the Restore Louisiana program was the hope Janice needed to continue her recovery efforts. After completing a program application, Restore contractors began working on Janice’s mother’s house; Janice gave her mother regular updates to encourage her. “I kept telling her, ‘I promise I’m going to bring you home’ and showed her pictures of the work that was being done,” she said. Janice says the process was completed faster than she thought possible. She was overjoyed when her Construction Technical Advisor called to notify them that her mother’s home was complete and her mother could move back in. 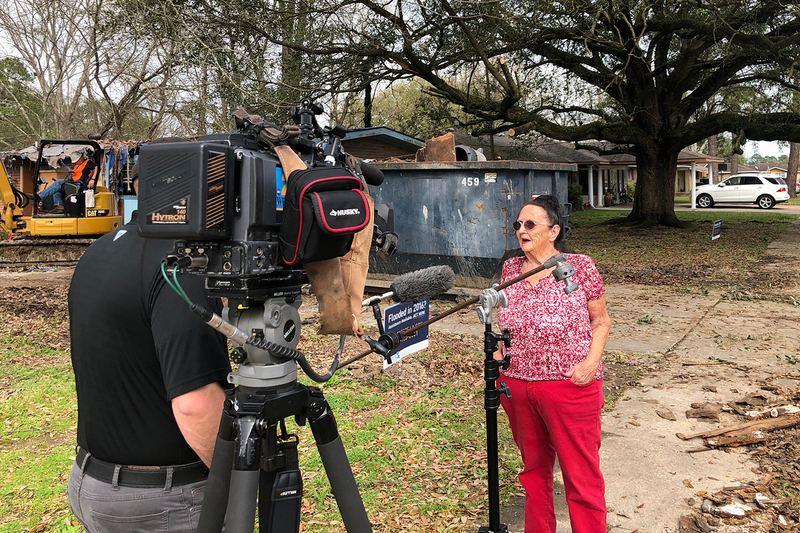 Meanwhile, Janice’s case manager informed her that Janice also qualified for funding to purchase a new mobile home, as Restore Louisiana’s policy is to replace, not repair, damaged mobile homes. “I am more than glad that I went through the program. Having mom in a clean home that is safe for her, that is the best part,” Janice said. HOLDEN, LA – In spite of the heavy rainfall, Sandra did not think her home would flood in August 2016. She and her husband had lived there for 30 years and never experienced flood damage. However, when floodwaters left severe damage to her home, Sandra was able to rebuild with help from Restore Louisiana. When the floodwaters reached her doorway, Sandra evacuated while her husband stayed behind decided to try and secure their home. Sandra’s husband packed what he could and left as the waters poured into their house and remained at high levels for days. Once they were able to return home, Sandra and her husband began the rebuilding process. They made as many repairs as they could, but the unexpected expense put a significant strain on their personal finances. One day, a friend told Sandra about Restore Louisiana. She called immediately to complete a survey. Shortly thereafter, Sandra visited the Hammond Housing Assistance Center to complete her formal application. “Everybody there was very nice and helpful,” Sandra said of the Restore Louisiana staff who helped her through the process. Restore Louisiana provided reimbursement for the repairs she and her husband already made to their home, and program contractors completed the remaining repairs, including new walls, countertops, molding, flooring and a new bathtub. Sandra said she was very pleased with how her home turned out. 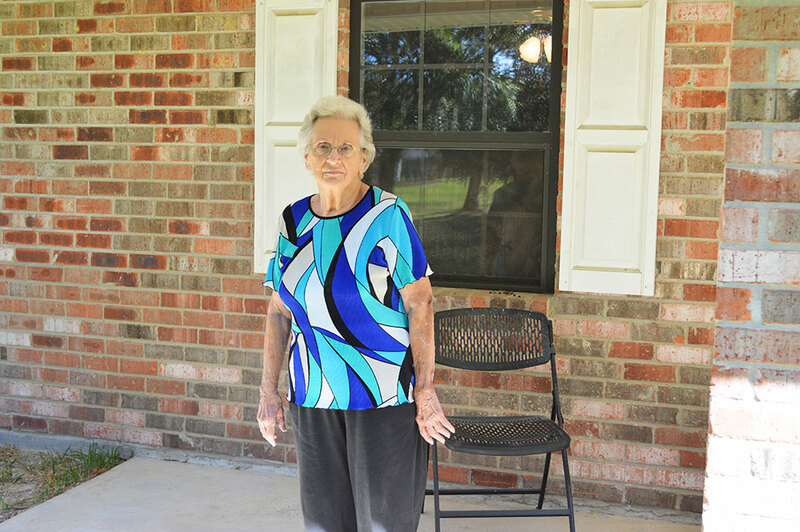 GUEYDAN, LA –”It’s like I’m in a new home,” said Pamela Campbell, who is relieved to be back in her residence of 28 years after suffering significant damage during the August 2016 flood. Pamela and her husband were able to safely evacuate their neighborhood and stayed with family for three days after the flood. By the time the roads were passable and she could return home, mold was already growing in the house. Through assistance from volunteers and FEMA funding, Pamela and her husband were able to make critical repairs to their home, but it was nowhere near complete. When she heard about Restore Louisiana, Pamela quickly got in touch with the program to see if she qualified for assistance. 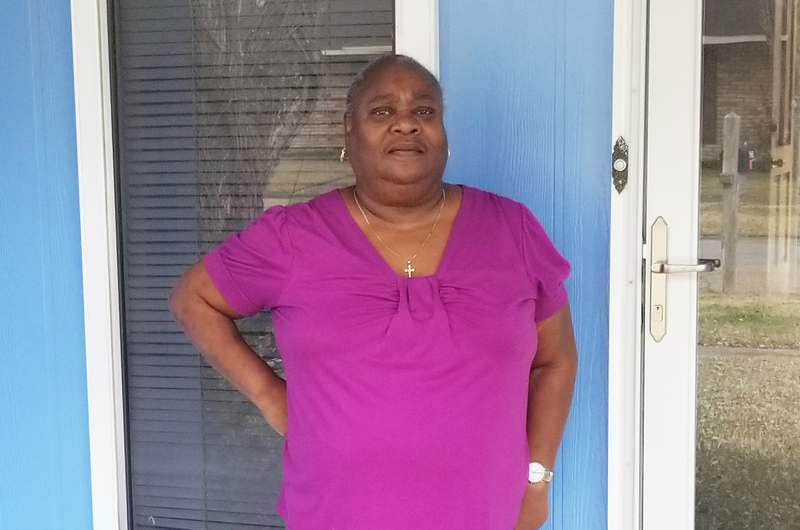 After completing her application, Restore Louisiana provided Pamela with reimbursement funds for the work she and her husband had already completed, along with assistance through Solution 1, in which a program contractor completed the remaining repairs to her home. Pamela lived in the house while the work was being completed. “It was a pleasure to have the program contractors there,” she said. Pamela and her husband are thrilled with the repairs and are thankful for their case manager and program contractors for helping them complete the process. DENHAM SPRINGS, LA – After Jackie Jacob’s house received more than three feet of floodwater, she feels very fortunate to finally be back in her home thanks to assistance from Restore Louisiana. On the day of the flood in August 2016, Jackie and her husband evacuated in their vehicles, hoping to get to higher ground. When they attempted to return home, the water had risen too high to drive through, so they waded in the knee-deep water to gather a few personal belongings. They stayed with Jackie’s sister for a few days while the water receded. Jackie was overwhelmed by what she saw when she was finally able to get back to her house. Jackie and her husband were able to complete most of their repairs with the help of family and friends, during which time she heard about the Restore Louisiana program. She finally decided to go online and fill out the survey. Shortly after, a Restore case manager contacted her and encouraged her to complete the application. She found the application process to be painless and simple. She said the program representatives she worked with were always kind and informative, keeping her updated as her application progressed through the program. Ultimately, Jackie qualified for both repair and reimbursement funds. Additionally, due to the Governor’s expansion of the Restore program, Jackie later learned she would be eligible to receive additional reimbursement funding from Restore. DENHAM SPRINGS, LA – In all the years that Misty Andrews’ family owned their home, it had never flooded. That changed in August 2016, when the flood severely damaged her childhood home. Today, Misty is thankful to Restore Louisiana for providing the assistance needed to repair the house associated with so many fond memories. She didn’t have the funds to hire a contractor, so she and her family began, and completed, most of the repairs themselves. Misty was almost finished with her repair process when she heard about Restore Louisiana, and immediately contacted the program. She filled out the initial program survey online, and was later connected with a case manager, who assisted her through the application process. After completing a formal application, Misty learned that she was eligible to receive both reimbursement and repair funds through Restore Louisiana. 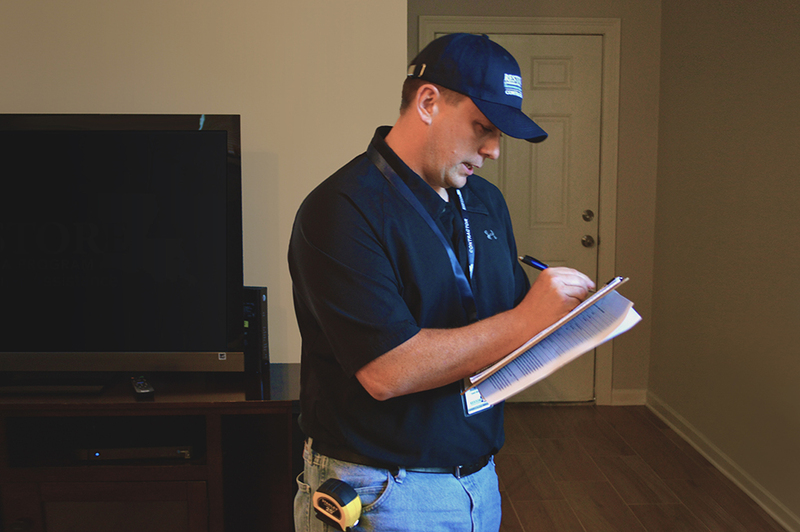 Misty chose Solution 1, and opted to use a Restore Louisiana contractor to complete her remaining repairs. Andrews says she is definitely glad that she found out about Restore Louisiana and went through with the process. “I found it to be a wonderful experience,” she said. 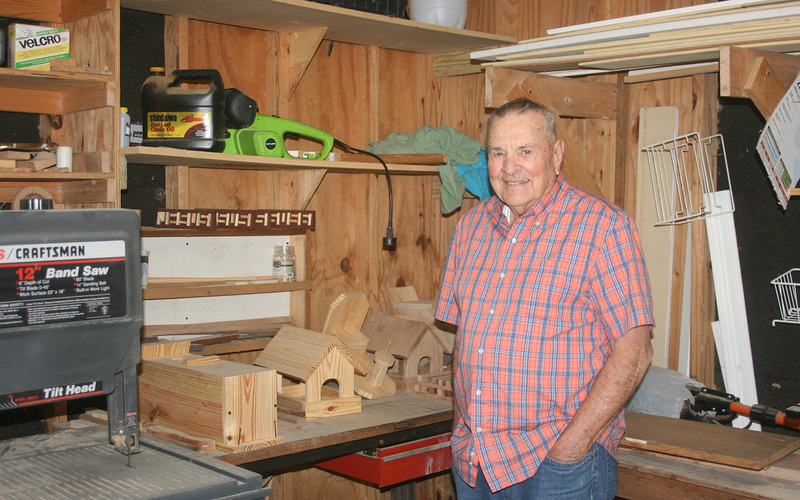 DENHAM SPRINGS, LA – Norman Picou used his savings to repair his home after the August 2016 flood. Today, he is grateful to be back in a safe, complete home after receiving reimbursement and repair assistance from Restore Louisiana. Norman and his wife evacuated with just a few of their belongings when floodwaters rose into their home. The next day, they learned from a neighbor that the water had receded. As they were making preparations to return, they were notified that their area had flooded again, and this time their house had taken on over three feet of water. Once they could finally return home, the couple began the painstaking process of repairing their damaged home. They tore out sheetrock and removed most of the flooring, working up to 16 hours a day. “I heard about Restore Louisiana on TV, and the moment they started accepting surveys, I went online and did mine,” said Norman. He then worked with program representatives to complete an application and continue through the process. Norman received reimbursement for repairs he completed himself, as well as additional funding to finish up remaining repairs. Rebuilding after the flood was a very difficult experience, and Norman is thankful it is behind him. “I have no complaints. I would do it again in a heartbeat,” Norman said of his Restore Louisiana experience. 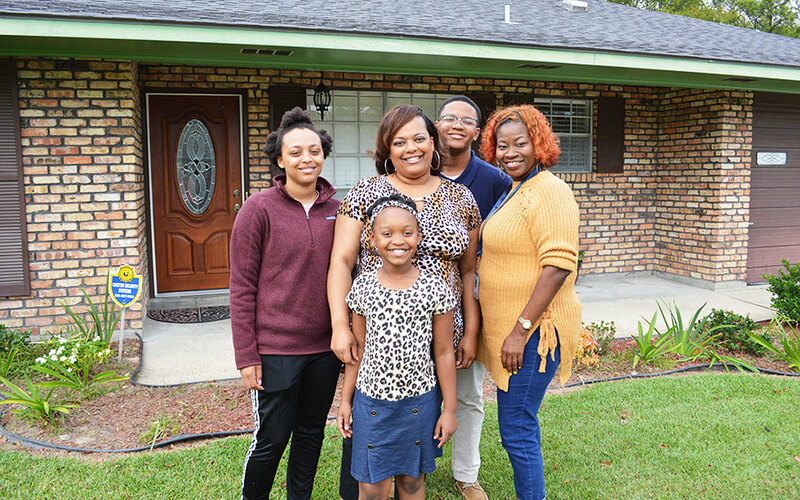 LIVINGSTON, LA – Shai Martin and her grandmother, Irene Martin, are happy to be living in a new mobile home, purchased with their Restore Louisiana grant award, after theirs was destroyed by the August 2016 floods. Shai and Irene were not able to return home for over a week after evacuating from the rising floodwaters. When the roads were finally passable, they returned to find their home was in an unlivable condition. The floors were completely coming apart, the doors would not close, and mold had already set in. When Shai learned about the Restore Louisiana Program, she visited the website and took the initial survey immediately. Later, she was invited to work with her case manager to gather all supporting documentation and complete her application for assistance. She found the application process to be straightforward. “I had a great case manager. She was right there to answer my questions,” Shai said. A program damage assessor visited Shai and Irene’s home to assess the damage, and Shai remained in contact with her case manager throughout the application process. Later, she learned they would be eligible to receive funding for a new mobile home, as the program replaces damaged mobile home units to best serve the long-term housing needs of mobile home homeowners. Shai says she was both thankful and excited when they were given the go-ahead to choose their new home. They found a three-bedroom, two-bathroom unit that was perfect for them. BATON ROUGE, LA – Pandora Lee was at home with several of her family members when floodwaters rose into their house in August 2016. She and her family evacuated before the water rose dangerously high, but they returned to find her home in complete devastation. Today, she is back in her home and is thankful for the assistance provided by Restore Louisiana. When Pandora returned home by boat a few days after the flood, she said the damage was unbelievable. With the help of family and volunteers, Pandora began the process of gutting and repairing her home, and making immediate, necessary repairs to make the home habitable. When Pandora heard about Restore Louisiana on the news, she called immediately to complete a survey. Shortly afterward, she began working with a case manager to complete an application. During her application process, Pandora chose Solution 1, in which the program provided a contractor to handle her remaining repairs. The program contractors completed extensive repairs including installing new sheetrock, cabinets, flooring, and a hot water heater. They also painted the inside of the house and completed electrical work to bring everything up to code. After returning home and settling back into her normal routine, Pandora has words of praise for Restore Louisiana. GONZALES, La. – Denise is grateful to Restore Louisiana for helping her purchase a brand-new home after her mobile home was destroyed by the August 2016 floods. As flood waters rose, Denise clung to her small dog and waded to higher ground up the street. She returned to her neighborhood after two weeks only to discover mold had set in and her home was in ruins. Denise heard about Restore Louisiana and immediately filled out a survey. Shortly after, program representatives contacted her to begin the application process and kept her informed as she moved through the program. 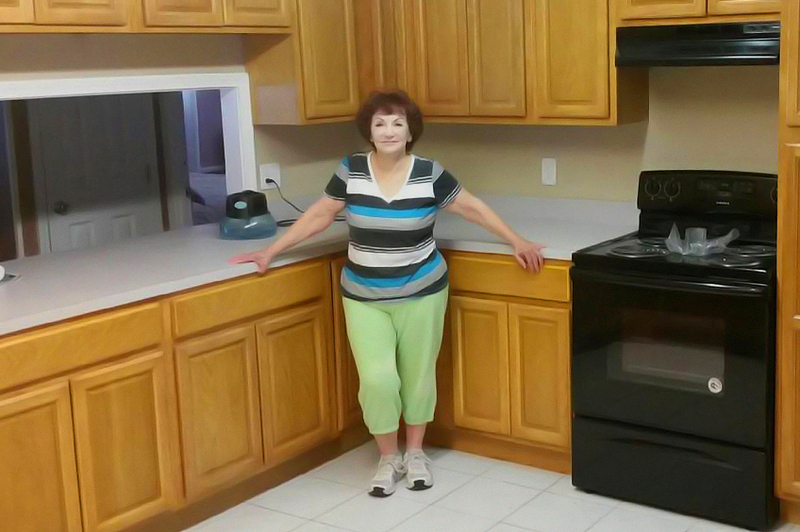 Denise was ecstatic to learn she was approved to replace her flood-damaged mobile home, and she worked with a local mobile home dealer to pick out a new unit to call home. Denise says she is thankful that Restore Louisiana was available to help her, and she encourages other applicants to stay positive. DENHAM SPRINGA, La. – Restore Louisiana applicant A.B. never expected to be impacted by the August 2016 flood, but as the floodwaters crept closer to her Denham Springs home, she was forced to quickly evacuate with her mother who was with her at the time. When she was able to return home once the waters receded, A.B. found that her home had taken on a significant amount of water, resulting in major damage to both the home’s structure and her belongings inside. Although A.B. received some repair funds from FEMA that were helpful in making some initial repairs, such as replacing sheetrock, her home was far from restored. Although she was hesitant to contact Restore Louisiana, A.B. decided to make the call, and she said she is glad she did. She completed the program application and was eligible for grant funds to continue making the necessary repairs to her structure. She was also eligible for a reimbursement grant to help cover the costs of repairs made before her damage assessment. Now, with the assistance of Restore Louisiana, she is back home and thankful to the program for providing the funds necessary to make critical structural repairs. “I thought it was a wonderful program, and I was glad I was able to get help, because I really needed it,” she said. DENHAM SPRINGS, La. – When one of Sharon Ballard’s clients encouraged her to contact Restore Louisiana, she hesitated because she didn’t think help would be available for her. After discussing it with her husband, she reached out, and she is forever glad she did. The Ballards are now living in their restored home and are thankful for the assistance provided by Restore Louisiana. At the time of the August 2016 flood, Sharon and her husband had lived in their home for over 35 years and never had any trouble with flooding in their neighborhood, so they thought their home would be spared. However, as floodwaters rose quickly, they were forced to evacuate – walking through waist-high water and catch a ride on a rescue boat nearby. After getting to higher ground, they stayed with a friend for a few days. Five days later, they were finally able to get back into their neighborhood, and they came home to unbelievable damage. Sharon and her husband began working to repair their home. They hired contractors to replace cabinets and floors, and they did the rest of the work themselves in order to save money. It was during the process of working on the house that they contacted Restore Louisiana. After completing the initial survey over the phone, they went into the Housing Assistance Center to begin their formal application. Ballard received a grant from Restore to reimburse her for the money she and her husband had spent up to that point. As she completed additional work on the house, the Program sent inspectors out to check on the progress. As work was completed, she received additional Solution 2 grant funds. “That was pretty awesome,” she said. BASTROP, LA – Travis Boone was surprised at the speed with which the floodwaters rose in March 2016. Before long, water had entered his home as he quickly tried to elevate his furniture and other personal items off the floor. The structure of the home sustained major damage. Today, Travis is grateful to be back in a fully restored home and for grant assistance from Restore Louisiana. After the flood, Travis and his family got to work repairing their home – pulling out the damp sheetrock and flooring, and treating the home for mildew. Travis did as much as he could himself and hired contractors to complete the work he could not do alone. Travis had completed the work on his home and moved back in when he heard about Restore Louisiana. At first, he did not think he would qualify for assistance, but he contacted the Program anyway, hoping to be reimbursed for the expenses he incurred in repairing the home. After completing the initial survey, Travis visited the Monroe Housing Assistance Center to complete his formal application. He was eligible for a Solution 3 reimbursement grant and received his grant funds in the mail a few weeks after his closing appointment. MONROE, La. – Clarease Isby was out of town when she heard reports of the Monroe area flooding in March 2016. Her house never flooded before, so she hoped it would be spared. By the time she returned home, she found the water receded from her house, but she could see that the damage was already done. “It was a terrible experience,” Clarease said. “Everything from the walls to the floors was damaged.” Although she didn’t lose all of her furniture, she had to hire movers to place her furniture in storage while her home underwent repairs. 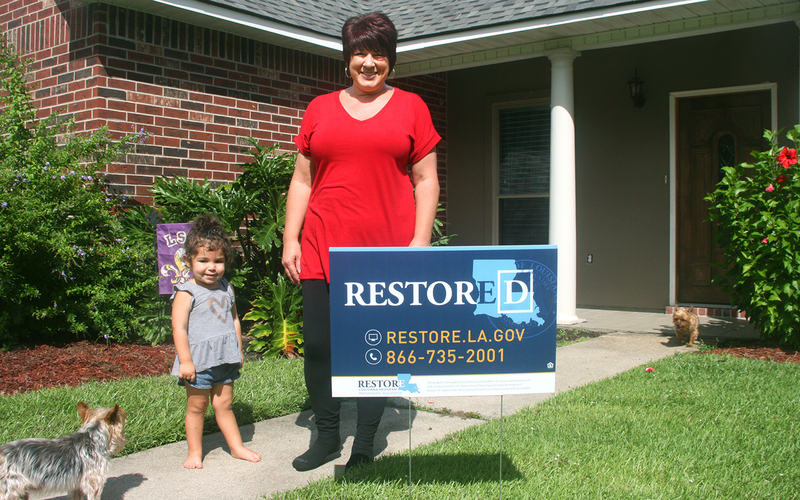 When the Restore Louisiana Program launched in April 2017, Clarease said she began seeing signs for the Program all over her area. She called 866-735-2001 to inquire about assistance and completed the initial survey. As she moved forward with the application process, Clarease said Program representatives helped her every step of the way. “Every program representative was professional and efficient,” she said. Clarease was eligible to receive Solution 3 reimbursement funds for the repairs she had already completed, and she selected Solution 1 – the Program-managed repair option – to finish the remaining work on her home. Today, her house is safe, comfortable and newly renovated, and she is appreciative to the Program for both the reimbursement funds and the assistance completing repairs. Their grandson helped them evacuate to their daughter’s two-story home, but they soon had to evacuate again as the water continued rising. When Robert and his wife returned home to survey the damage several days later, they found the contents of their home had been moved by the floodwaters, and their cars were still largely underwater. Once the floodwaters receded, they began cleaning and repairing their home, all the while living in a camper set up on their driveway. Robert did as much work as he could do himself, and he hired contractors to complete the unfinished repairs. When Robert heard about Restore Louisiana, he was hesitant to contact the program because he didn’t think help would be available for him. His daughter convinced him to take the initial survey, and after that, he says everything went like clockwork. Robert was pleased to learn he was eligible for a Solution 3 reimbursement grant from Restore Louisiana that would help him recover some out-of-pocket expenses. HAMMOND, LA – Catherine Swicegood thought she would be spared from the August 2016 flood when the rain stopped and the water had not crept high enough to impact her home. But as the floodwaters continued rising in her neighborhood, she was soon forced to evacuate. When she returned once the water had receded, she was shocked to see the damage to her home. She enlisted the help of her son, who has a background in contracting, to begin cleaning the home and making repairs. Although the family tried to purchase supplies as inexpensively as possible, Catherine says she was still maxing out her credit cards just to do basic repairs and found herself in a desperate situation. When a friend at church told her about Restore Louisiana, she didn’t want to get her hopes up, but she submitted an initial program survey and was soon invited to complete a formal application. Catherine says she was thrilled to discover that she was eligible for Solution 2 repair funds and Solution 3 reimbursement funds. Later, when the program announced that reimbursement assistance would be expanded from 50 percent to 100 percent for eligible homeowners, Catherine’s construction advisor contacted her to share that she would be getting the remaining half of the reimbursement funds she was eligible for. Catherine says she is overjoyed to be back in her repaired home thanks to Restore Louisiana and is grateful to program team members – including her case manager and construction advisor – for their help. MONROE, LA – Vernie Jean Williams had lived in the same home since 1988 and never experienced issues with flooding – that is, until March 2016. 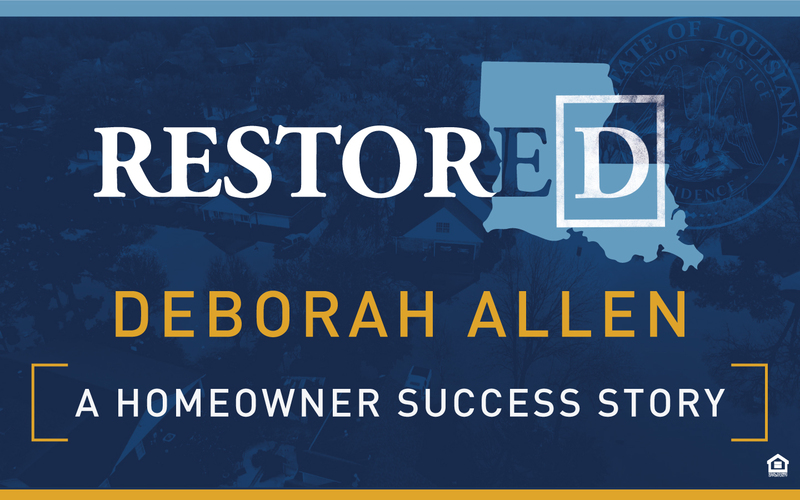 When she learned about the Restore Louisiana Homeowner Assistance Program through an announcement on TV, she contacted the program to complete an initial survey for assistance with repairing her home after it was ravaged by the flood. To her delight, she was invited to submit a formal application for assistance and visited the Monroe Housing Assistance Center to receive assistance in-person with submitting the required documentation. 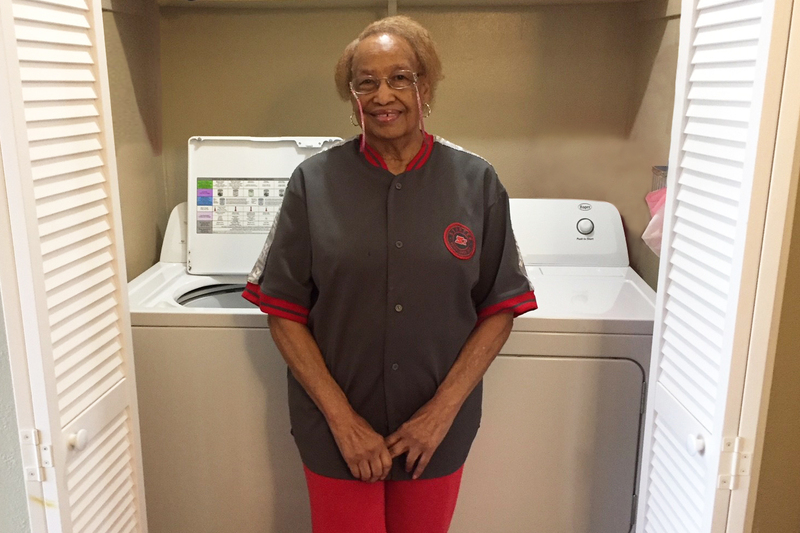 “When I found out Restore Louisiana would help me, I was so relieved,” said Vernie Jean, who opted to have her remaining repairs managed by the program under Solution 1. During the process of making the necessary repairs to her home, inspectors closely monitored progress and were comprehensive in their approach. Now back in a comfortable, restored house, Vernie Jean says she is thankful for the program and pleased with all the work. MONROE, LA – Mario Garcia was at home with his wife, who was seven months pregnant at the time, and their two-year-old daughter when the family was forced to evacuate due to rising floodwaters in March of 2016. When Mario returned to the house days later, he found that it had sustained severe damage. Once the last few inches of water finally receded, Mario enlisted the help of family and friends to begin gutting the home and readying it for repairs to get his growing family back to normal as soon as possible. Mario and his family stayed with relatives for about ten weeks as work continued on the home. Mario and his wife, along with both of their daughters, were back in their house when a friend told them about Restore Louisiana. Mario was invited to complete a formal application and was soon assigned a case manager. Mario was eligible to receive Solution 3 reimbursement funds. Later, the program announced that applicants who had initially only received 50% of the reimbursement funds they were eligible for would now receive the remaining half of their eligible funding. Mario was over the moon. Mario says he was so pleased with his experience with Restore Louisiana that he encouraged his wife’s grandparents to complete the initial program survey as well. Now back in his fully restored home, Mario says he is appreciative for the grant assistance and, above all, thankful to finally be back home with his family. DENHAM SPRINGS, LA – Restore Louisiana applicant K.W. and her daughter awoke on the morning of Friday, August 12, 2016, to find water covering the floor of their Denham Springs home. After making a quick evacuation, K.W. returned home a few days later to take inventory of the damage. K.W. was in the process of making repairs to her home when her mom told her about Restore Louisiana. K.W. didn’t think she would be eligible, but she submitted an initial survey anyway and was surprised to find that she was invited to complete a formal application. The program’s damage assessment team visited K.W.’s home to review the repairs she had completed, and she was pleased to discover that she was eligible for Solution 3 reimbursement funds that helped cover the cost of the work she had already put into the home. K.W. says she is thankful to the program for helping her feel fully restored after the devastating August 2016 flood.